Saturday’s competition had a “steamworks” theme, in which robots threw balls into “boilers” and brought gears to “airships” to turn rotors for points. Crowds were cheering, flags were waving and “Go, go, go!” chants filled the air of the Half Hollow Hills High School West gym in Dix Hills. 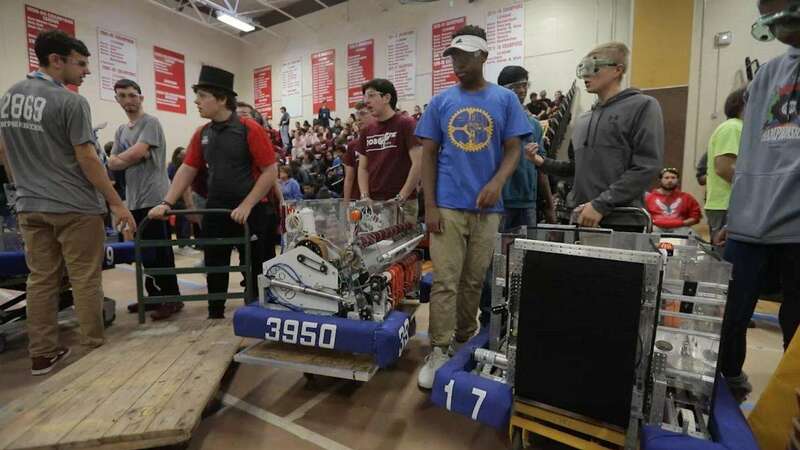 The hundreds of spectators were watching a robotics competition, not a basketball game, although, like basketball, teamwork was essential to victory. Twenty-four high school teams from across Long Island competed Saturday in an exhibition tournament. The similarity to team sports is not an accident. The robotics “players” must learn to work together, said Ken Vessey, 51, of Dix Hills, the father of a Half Hollow Hills team member and a mentor to the team. That’s especially important for kids interested in science, some of whom are “socially awkward” and may not be used to working in groups, said Vessey, an engineer in the Melville office of UL. After students graduate and are in the work world, “if you can’t communicate and work with others in your group, you can’t succeed,” he said. For the students, the raucous atmosphere and the goal of victory motivate them to do their best, said Vessey’s daughter, Gianna Vessey, 16. Saturday’s competition had a “steamworks” theme, in which robots threw balls into “boilers” and brought gears to “airships” to turn rotors for points. Robots could block each other to prevent a rival from scoring. Each match began with a 15-second period in which the robots had to move on their own, sometimes with software-programmed cameras and LED lights. Then the students stepped in to maneuver the robots. “Go around him, go around him!” shouted West Islip coach Andy Baranec as team members Owen Di Stefano and Justin Keane, both 16, used Xbox controls to move the robot and its gears toward the airship. The more gears that were brought to the airship, the greater number of rotors that could operate. The three-team alliance that West Islip was a part of lost the match. But, like a basketball coach applauding a three-pointer, Baranec praised Di Stefano and Keane for their robot-guidance skills. “That was flawless,” he said.